Anthony Taglia leads a busy, active life with little time to be sidelined by an injury. A frequent marathon and triathlon participant whose exercise regimen is similar to CrossFit, Taglia is accustomed to the aches and pains that come from hard workouts. So when a partial tear in his chest and shoulder muscles left him almost unable to lift his arm, he was hopeful the problem could be fixed through physical therapy rather than surgery or another type of medical treatment. Several months after meeting a Body Gears staff member and hearing about the difference between conventional physical therapy and Functional Manual Therapy™, Taglia decided to give Body Gears a try. “The Body Gears staffer I met seemed pretty passionate about what they were doing and I thought I would give them a shot before going to someone who would cut me open,” said Taglia. Comprehensive treatment began with an investigative series of tests lead by Dr. Leah Schmitt, PT, DPT. Though an MRI that revealed a partial tear, Schmitt thought Taglia had a good chance of healing with intensive therapy techniques based on her previous patient experiences. Schmitt did a lot of deep tissue work and Functional Dry Needling to more effectively get to the tissues that weren’t responding to the mobilization techniques. Several other therapists on site showed Taglia exercises, first intended to get his full range of motion back (such as band work) and then plenty of work on his core to correct the form and posture he utilized while exercising. Schmitt gave Taglia tips on his overall body mechanics, looking at not only his right shoulder and pectoral but scars on his left arm and places where he was overcompensating because of restrictions around the brachial plexus. Today Taglia is pain free and he can again focus on his active life. The half dozen friends and colleagues he has sent over to Body Gears are equally impressed. 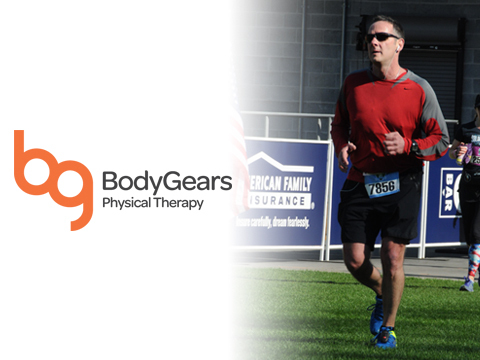 If you are a CrossFit or exercise enthusiast and can you relate to Anthony Taglia’s story, click here to meet Body Gears physical therapists and learn more about their passion for fitness and exercise as well as their areas of treatment expertise. We believe that freedom of movement is the foundation of a healthy and satisfying life. We look forward to serving you and we welcome your questions, comments and inquiries. 877-709-1090.